I had the item appraised by a jeweler in St Louis. He described it: 14kY YG/WG Enameled Flower Broochwith 32 round full cut diamonds “S11” in clarity and “G” in color=approx 1. Oct. total weight 14dwt. Petals are moveable. Thank you for submitting your brooch for appraisal. This item has a flower shape and every petal is enameled of a vivid orange-red color. It appears to be 14kt white and yellow gold and there are prong set diamonds. The petals can oscillate thanks to yellow gold pins which connect them to the main part of the brooch. There are diamonds set in white gold, 12 as pistils and the others set on the flower stem and leaves. A small diamond seems to be missing on the stem, while an orange stone is the central pistil of the flower. All the diamonds are full cut diamonds weighing 0,01ct-0,035ct each, for a total weight of 1ct approx. The diamonds appear colorless, approximated they are G-H color and SI1 clarity. The total weight of the brooch is about 21,8g and it is unsigned. 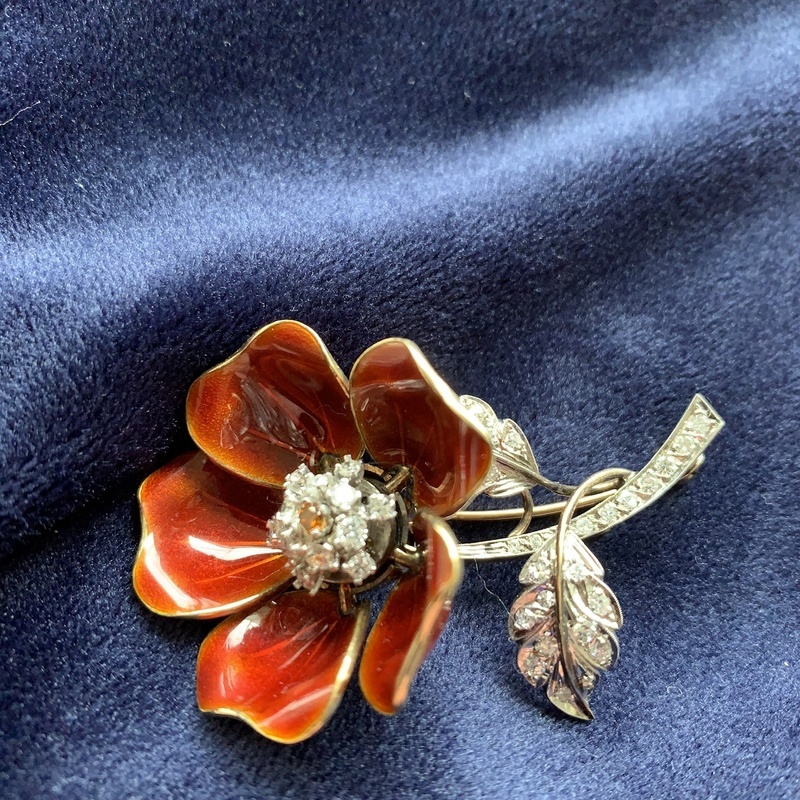 This type of brooches with enameled floral design were popular during the Edwardian Era and observing the pictures the pin looks original from this period. Please let me know if you have any additional questions. I'm glad to give you my support.